The Atwood Fund was established in September of 1916 by Mr. Eugene Atwood, the head of the Atwood Machine Company, located in Stonington, Connecticut in the late part of the 19th century. Mr. Atwood was an inventor and prized the value of education. Mr. Atwood had three living daughters and one grandson at the time he established the Fund. Mr. Atwood intended the fund to assist young people, both boys and girls, who would otherwise be held back by a lack of financial resources to make the most of their opportunities. Since its establishment in 1916, the Atwood Fund has provided over $5,000,000 of support to New London County students with interest-free loans and achievement based awards to help them attend college. When students repay the loans, 100% of the returned funds go back out in loans again to other students. Returned loans and donations have multiplied value to helping to educate our community, because the funds get reused and recirculated upon return. ​The Eugene Atwood Fund is a non-profit 501(c)3 and a Private Foundation within the meaning of section 509(a) of the tax code. We are based in Stonington, Connecticut. ​The Eugene Atwood Fund Board is comprised of volunteer community and family members who oversee the Interest-Free Loans and Awards processes through an annual review of qualified candidates. The 19 area New London County High Schools are invited to nominate an Atwood Award Recipient each year in January and February. Grants will be made to 3-5 area students. ​The Board meets in April/May to vote on Loans and Awards. Atwood Awards are distributed by July. ​Loans are paid to the student and the college by July and December during the registration periods. Loan repayments come back into the fund monthly, and are managed for re-distribution. We are inspired by application essays that demonstrate how individuals want to create opportunities for themselves and others through gaining education and skills for a productive and industrious future. Eugene Atwood was the third generation working in milling and machinery and he was always fascinated with how to improve the business and never complacent about just "getting by." 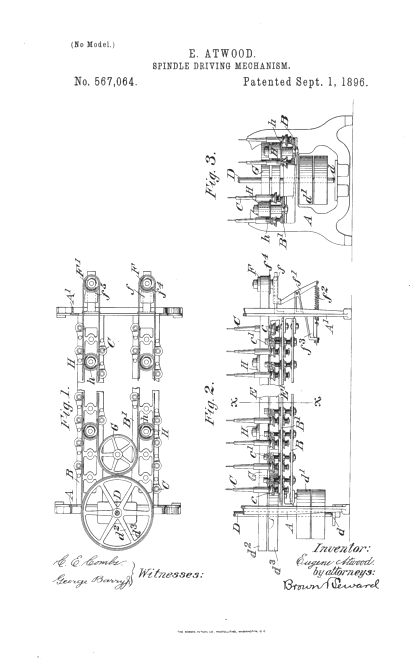 Inventions with patents can be seen above and here . How do you want to imagine or invent your future? Lets us know. The Fund was established, four years before women were granted the right to vote in August of 1920. Eugene Atwood was a forward thinking person wanting the best outcome for everyone. We are looking for forward thinking students. One Trustee is the first grand-daughter of the first grand son of Eugene Atwood. The financial trustee is a the grandson of the president of the Atwood Machine Company, Franklin R. Hoadley, who succeeded Eugene Atwood as president after his death in 1926 and successfully ran the company until the 1940's. Two Trustees are great grand children of Eugene Atwood, and two are great, great grandchildren. One is a generous member of the community. Who are you? What do you want do? How will you innovate and what will you pass on? Apply, study, and find out. You are the future. Become the Eugene Atwood of your time. The Atwood Machine company no longer exists in Stonington, CT, but, when it did, it generated the money that went into establishing an Education Fund to benefit generations of future students. We hope many of you, once educated will seek to build successful businesses in Stonington and New London County in the years to come. What will you invent? Clean technology jobs, engineering marvels, apps? 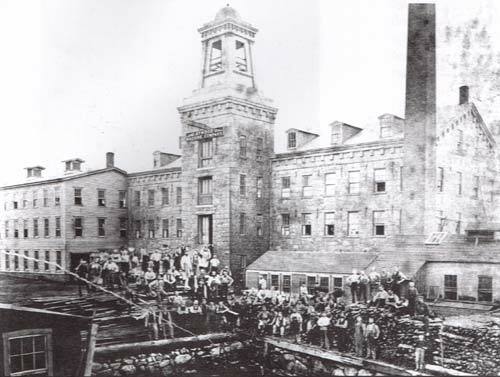 The Atwood Machine Company moved to Stonington, CT in 1876 when the previous plant lead by John Edwin Atwood , (Eugene's father) suffered a fire in Willamantic, CT and they needed a new space to rebuild the business. Eugene Atwood became the new president of the company when they incorporated in Stonington in 1876. They moved to the Trumbull factory building in Stonington and remained there for seventy years. The company prospered, setting up offices in New York and selling its silk making machines around the world. John Edwin Atwood died in Stonington in 1903, and his son Eugene led the company until his death in 1926 when Franklin R. Hoadley took the reins. After the death of Eugene Atwood in 1926, Franklin R. Hoadley led the company brilliantly through new challenges as they worked to keep pace with changes in the textile industry, such as the rise of knitted and woven goods and the appearance of rayon and nylon undermining the value of silk. It rallied strongly from the devastation of the 1938 hurricane (see photograph from the company newsletter below). Atwood almost closed before World War II, but Hoadly won an Army-Navy "E" for its work on war contracts and put off the inevitable until 1945, when no longer cutting edge manufacturing it was sold. In 1916, ten years before his death, Eugene Atwood established a Trust Fund that he hoped would provide reinforcement and help for motivated hardworking youth seeking to better themselves. ​We are working to continue to facilitate his vision and hope that you are motivated to work for yourselves, and others going forward. This Loom was made by The Atwood Machine Company in 1875 in Stonington, CT for the purpose of weaving Silk Taffeta and is currently on display a the Windham Textile and History Museum in Wilamantic, CT. The purpose of the conflict of interest policy is to protect this tax-exempt organization's (Organization) interest when it is contemplating entering into a transaction or arrangement that might benefit the private interest of an officer or director of the Organization or might result in a possible excess benefit transaction. This policy is intended to supplement but not replace any applicable state and federal laws governing conflict of interest applicable to nonprofit and charitable organizations. Any director, principal officer, or member of a committee with governing board delegated powers, who has a direct or indirect financial interest, as defined below, is an interested person. No members of this Board have a direct nor indirect financial interest. c. A potential ownership or investment interest in, or compensation arrangement with, any entity or individual with which the Organization is negotiating a transaction or arrangement. d. If a more advantageous transaction or arrangement is not reasonably possible under circumstances not producing a conflict of interest, the governing board or committee shall determine by a majority vote of the disinterested directors whether the transaction or arrangement is in the Organization's best interest, for its own benefit, and whether it is fair and reasonable. In conformity with the above determination it shall make its decision as to whether to enter into the transaction or arrangement. b. If, after hearing the member's response and after making further investigation as warranted by the circumstances, the governing board or committee determines the member has failed to disclose an actual or possible conflict of interest, it shall take appropriate disciplinary and corrective action. a. The names of the persons who disclosed or otherwise were found to have a financial interest in connection with an actual or possible conflict of interest, the nature of the financial interest, any action taken to determine whether a conflict of interest was present, and the governing board's or committee's decision as to whether a conflict of interest in fact existed. A conflict of interest policy is intended to help ensure that when actual or potential conflicts of interest arise, the organization has a process in place under which the affected individual will advise the governing body about all the relevant facts concerning the situation. Our conflict of interest policy is also intended to establish procedures under which individuals who have a potential conflict of interest will be excused from voting on such matters. No governing members of The Eugene Atwood Fund Board receive any compensation nor financially benefits from the organization.